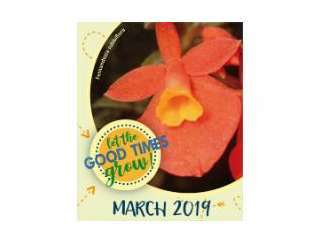 At this year's two-day show, "Let the Good Times Grow!," The American Orchid Society will judge plants on exhibit. Vendors will offer a large variety of orchids, companion plants that grow with orchids, orchid books and orchid supplies for sale. Orchid culture, re-potting demonstrations and plant doctors will provide valuable information to orchid enthusiasts. A weekend drawing will benefit Welcome Home Military Heroes. Take a coffee break or enjoy lunch at the show. Don't miss the fun in the kids' activity area. Open March 30 and 31.